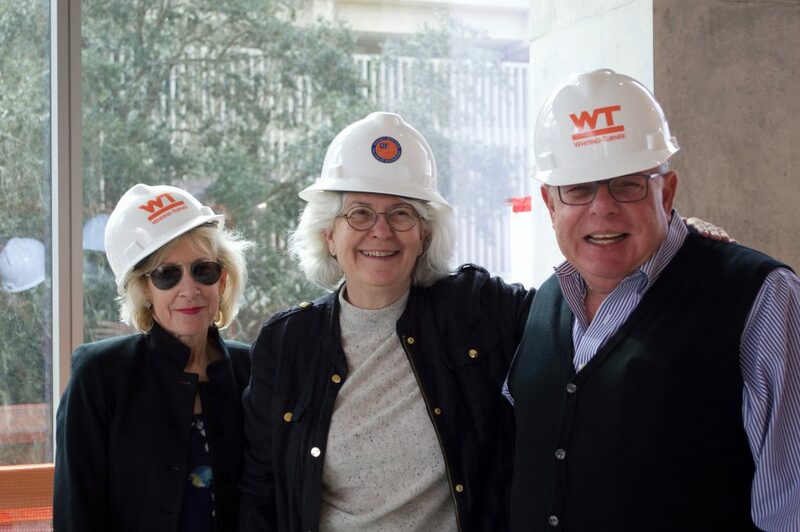 On January 24, the Whiting-Turner Construction Company hosted college officials, alumni, and the jobsite crew to celebrate the completion of the core of the new Herbert Wertheim Laboratory for Engineering Excellence. Guests penned good wishes for the future of the building and left their signatures on one of the large pre-cast concrete walls on the first floor of the structure. 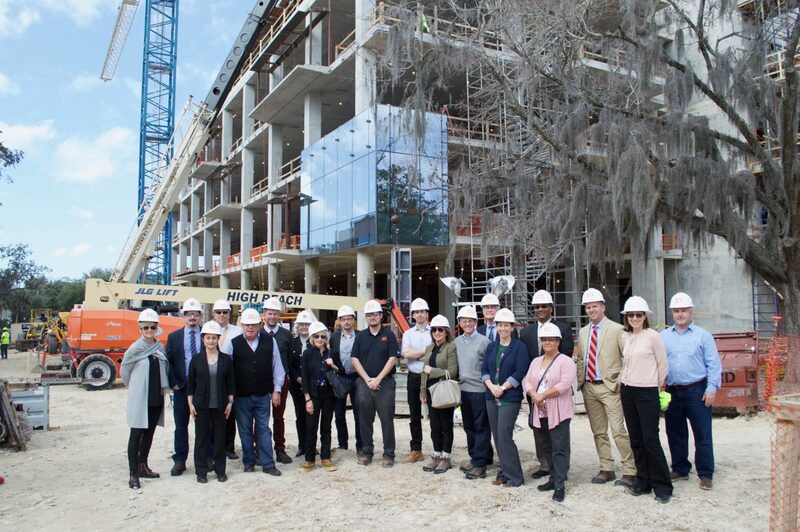 During the following tour of the lower floors of the construction site, the visitors got their first glimpse of the modernistic glass curtain wall that will wrap the front and sides of the much-anticipated new edifice. Christian Hoenigschmid-Grossich, associate principal at Grimshaw Architects’ New York office, spoke about some of the key green features of the building such as the energy savings that can be realized from the strategic use of glass for lighting. “This building, like others on the UF campus, was designed with Leadership in Energy and Environmental Design (LEED) certification in mind, and we expect to achieve a LEED Silver rating.” LEED standards are applied to the design, construction, operation and maintenance of buildings in order to help owners and operators of the buildings act sustainably and efficiently. After the tour, everyone enjoyed an al fresco barbecue set out in the first floor area that will soon become finished spaces for 3-D printing rooms and prototyping assembly areas in the Freshman Engineering Design Lab. At the conclusion of the celebration, Justin Berry, project manager for Whiting-Turner, announced that, to date, the crews had completed 125,000 person-hours of work on the building. “It has been exciting to see the five stories of concrete rising here on the Reitz Union west lawn, but now we have to work even harder to build out all the spaces and get things ready for students and faculty. While we will work with all speed, our first focus will be to work safely.” Whiting-Turner has been awarded OSHA Partnership status at both the federal and state level on more than 25 projects, and its corporate safety and health methods exceed construction industry standards with a premium placed on innovation and improvement. The College hopes to open the doors to the Herbert Wertheim Laboratory for Engineering Excellence by the end of 2019, and have students working on designs early in the new year. When Dr. Herbert Wertheim first gave a $50-million gift through his Dr. Herbert and Nicole Wertheim Family Foundation, lending his name to the College and starting its transformation, he shared his excitement about the new building with a group of students. 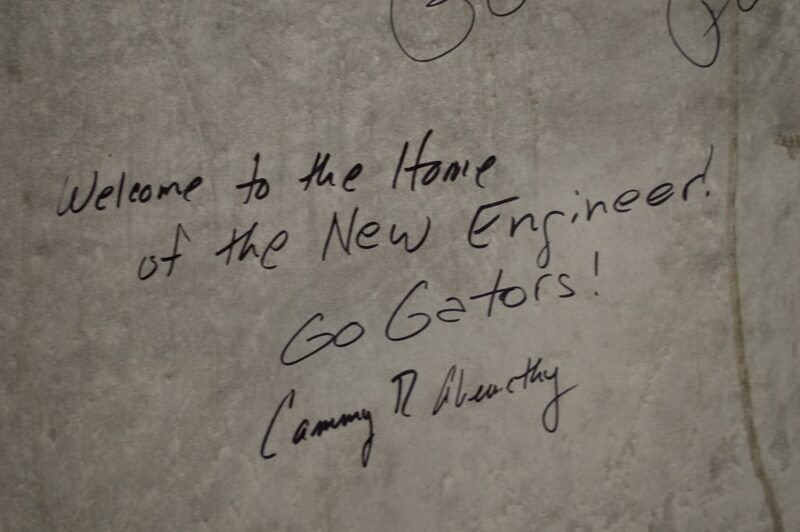 The flagship building located in the heart of campus will be home to the New Engineer at the University of Florida.